Official synopsis: "I have a curse. I have a gift. I am a monster. I'm more than human. My touch is lethal. My touch is power. I am their weapon. I will fight back. Juliette hasn’t touched anyone in exactly 264 days." Holy crap, what a book! 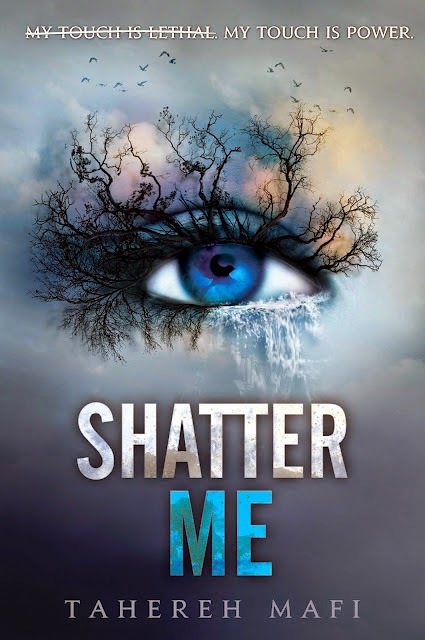 The Shatter Me trilogy doesn't have a UK publisher and whilst it's done pretty well over in America it is virtually unknown over here unless of course you're a blogger and you see what is being spoken about all the time. Earlier this year I happened across the book on Amazon and I had seen a spike of interest for the book over here with a few UK based bloggers getting the books and announcing just how amazing they are and I thought, well, why not give it a go. I had been experiencing a pretty bad reading slump when my copy arrived through the post and was eager to read something that would get me flowing again, reignite the spark I had seemed to have lost. And Shatter Me turned out to be just what the doctor ordered. Right from the off I fell in love. The book is written in such a weird, unique and ultimately interesting way that that itself hooked me straight away. Sometimes words, sentences, whole paragraphs and even pages are crossed out as Juliette edits her thinking as she goes along. For me this was quite fun because sometimes it would changes the whole meaning of a sentence or a piece of dialogue and it could go so many ways. It is told in first person and Juliette talks in metaphors and similes all the way through the book. Sometimes passages made my head spin they were chock full of metaphors but it all added to the imagery and overall feel of the book, which I liked. Juliette herself is quite a tragic character, and I really found myself pitying her the whole way through the book. She's so alone, so lost, so afraid. She has a condition, a disease she has been told, which means she cannot touch another living thing, because if she does, she will kill them. She will become an unintentional murderer, and it has already happened. Locked away in an asylum in a world that is literally falling apart at the seems, she has nothing left. Nothing. And then Adam comes into her life, thrown into her cell it soon becomes clear that he isn't exactly as he seems and soon Juliette learns something that will change her world forever. She can touch Adam, and he doesn't die. Soon, they fall in love, a love that felt so real, so genuine and so passionate that I was frankly jealous of Juliette, I wanted my own Adam. But all isn't well for Juliette and Adam as there is trouble brewing. The Reestablishment has taken over the world, and it just so happens that one of its leaders, Warner, is fascinated with Juliette and her macabre ability which he sees as a gift. He wants to use her as a weapon against the rebels that threaten to overthrow the system, but she is less than co-operational. I am so glad I actually picked up this book. I hadn't even finished it and I had to order the next 2 books in the trilogy, it was that good. I just fell in love with everything. From the writing, to the world building, to the characters and their different relationships, I couldn't help myself. After several weeks of barely reading a word this book helped me so much and I am so grateful to Tahereh Mafi for that. I've already read the second book, Unravel Me, so a review for that one will follow, and I cannot wait to get around to reading the final book, Ignite Me, to see how it all ends!